Today’s post was going to refer to Ester! I love Ester’s story of the Bible. However, I received some news last night and I wanted to share it in this forum. Ester’s story will be posted next week. Friends, I am deeply humbled and amazed. The Lord has been too good to this undeserving being. Last year we travelled to Honduras, to visit my husband’s relatives. During our visit, we visited a very small church in the city of Comayagua. The church was located in a very poor and dangerous neighbourhood and was the only church of Apostolic faith in the whole city. The Pastors are very humble people and of a very humble livelihood. During our visit, we understood that one of the things they lacked, because there were just not enough funds for it, was apostolic literature. The only thing they had was a binder copy of book, which looked like it had been used, over and over again! They expressed their desire to obtain literature that spoke about our apostolic beliefs. The Pastor’s wife and I specifically spoke about modesty and outward holiness and how she desired to learn more and strongly believed in its importance. My husband mentioned to her that I wrote a book about modesty and she requested a copy. To make the story short, we left there very humbled by the experience and made the commitment to keep in touch with them to give them encouragement and to send them literature. 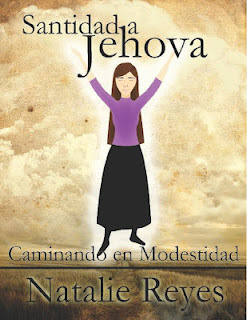 When we returned home, within a month and with the help of donations made by our customers at Apostolic Truth Books (a small library we run), we were able to send them 6 books, all of apostolic faith, including the book I wrote in Spanish, entitled “Walking in Modesty”. Shortly after they received the books, they called us to say how much of a blessing they were to them and we were content to have been able to contribute in a small part to their ministry. We have kept in contact with them, ever so often since then but hadn’t heard from them in a few months, until last night. The phone rang at 11:30pm at night! We were just about to doze off and were a bit freaked out! Usually when you get calls at the middle of the night, it’s never good news! But it was the dear Pastor Manuel from Honduras. He just wanted to let us know that a year later, they had now moved into the city, a better location where they will be able to reach more souls WITH this JESUS message of truth. Praise God. But he also wanted to let us know, that the book that I wrote has been a tremendous blessing for them and that they made a whole lot of copies to use at different conferences that they organized. They recently did a women’s conference with all of the ladies from the churches in Honduras just based on my book alone! The Pastor also told us that the missionary to Honduras made copies for use in the new churches which will be opening in the country. The other day, I noticed on the statistics page that my blog was being read in Honduras, using google translate, I was wondering how people came across my blog all the way down there, but now I understand! I feel so humbled to know that the booked has blessed and convicted so many ladies on this topic of Modesty. Who knew 1 person (with God) could actually make a world of difference, one person at a time. I mean, I know we always say, with God everything is possible, but sometimes we believe that for everyone else, except ourselves. As I write this I am tearing, the Lord, once more has amazed me. I am so unworthy to be vessel which he has used. Frankly, I never even thought the book was that amazing! I always felt I could have done it much better, but God does amazing things. With all of this I want to give Glory to God, He is the one who is in control of everything, He is the one who opens doors, He is the one who makes us able to do anything. When I wrote the book, I never ever, ever thought, it would go such a long way. The most I thought was that it would be a help for the girls at the church at which we minister at. But this verse has been resounding in my head “For as the heavens are higher than the earth, So are My ways higher than your ways, And My thoughts than your thoughts.” Isaiah 55: 9. The Lords plans for our lives are much higher than what we may believe, all we have to do, is do things with love and humbleness and he will take care of the rest. I want to encourage you my dear reader to believe that with all your heart. If the Lord has placed a passion in your heart to do anything for the edification of His kingdom, to bring blessing, to make this truth know in different ways, as small as that idea may be, go ahead, get up and do it! You never know how far it will go, you never know how many people, the Lord will allow you to bless. Receiving this news was the confirmation I need to start another project, it’s like God was telling me, I agree with what you’re doing, go ahead, I will prosper it. I will share more on that with you in the coming weeks! I hope this post has been an encouragement to you, to do more for the Lord. The Lord has put in us all a passion and burden for something in his kingdom, act upon that burden and you will see that the will of God always is prospered in your life. Let’s make a difference in this world, together, one person at a time, we can reach our world, with the Message of truth of the One true God. thats awesome! God has big plans for you! That is wonderful. Praise God. I'm totally inspired!! What Does Our King Desire?